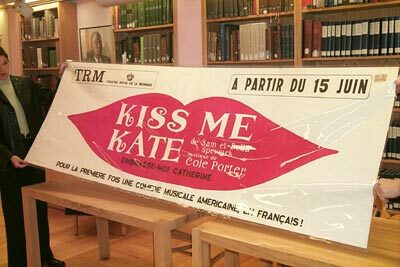 An original poster announcing the French premiere of Kiss Me, Kate. There are 75,000 items in the Spewack collection, including letters, manuscripts, scripts, screenplays, diaries, documents, motion pictures, playbills and more. When the lights came up at the Lucille Lortel Theater on a recent evening for a premier performance, the private side of Sam and Bella Spewack, the renowned husband and wife Broadway writing team, became public years after their death. "A Letter to Sam from Bella," an original one-act play by Broadway director Aaron Frankel, is based on the Spewack personal papers from the Theater Arts Collection of Columbia's Rare Book and Manuscript Library. Among the audience were producers, authors, actors and contemporaries of Sam and Bella Spewack, including some of the Spewack's god-children and an original cast-member of "Kiss Me Kate," the 1940s hit musical on Broadway written by the Spewacks with music by Cole Porter. Also in the house were Lois and Arthur Elias, the Upper West Side residents who were entrusted with the literary rights to "Kiss Me Kate" as well as other Spewack materials. In support of the project, the Lucille Lortel Theater Foundation, which provides financial support for emerging playwrights, donated the stage and staff for the production. Actors Abetha Aayer and Eugene Smith were featured as Bella and Sam. The project was the brainchild of Aaron Frankel (CC'42), former Columbia theater faculty member, who currently teaches at NYU and the New School and has been a long-time figure in New York's theater scene. "Aaron wanted to bring attention to the Rare Book and Manuscript Library's Theater Collections," said Katherine Underwood, Columbia development officer, who helped organize the event. "So we put this event together to show people what the collection has to offer." Supporting the Rare Book and Manuscript Library has been a hobby of Frankel's for years. When the library received a donation of Tennessee Williams' material in 1995, Frankel browsed through the documents, found two unproduced one-act plays, A Cavalier for Milady and Now the Cats with the Jewelled Claws, and organized a similar benefit reading five years ago. For Frankel the library is a place of "unique treasures," one of which he came across two years ago while doing research on the Spewacks. The story of the pair as a couple and as co-writers, based on their letters to one another captured the "dramatic pith" of almost 50 years. "This couple was married almost 50 years and yet spent much of their married lives apart," said Frankel, noting the couple's commitment to hard work, which translated into an unusual track record of professional success in the tough fields of stage and screen. The play also revealed the side that was painstakingly hidden--marital problems that caused the couple to split for a time. "It was a lot of work, but well worth it," said Frankel, who specifically wrote the play for his second benefit reading for the Library. The play opened after only one week of intensive rehearsal. For Frankel the biggest challenge was translating material written in a literary style to words that "fit into the actor's mouths." All this effort was for a one-time performance. But based on the captivated audience during the performance, his labor of love paid off. And the play, depending on its acceptance by critics, might have longevity. 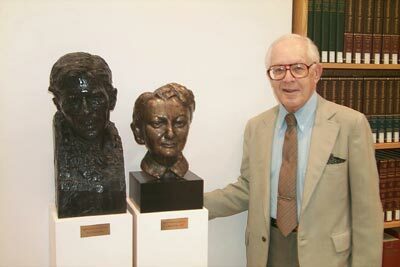 Aaron Frankel stands with busts of Sam and Bella Spewack that were donations to the Rare Book Manuscript Library. Sam had been a student at Columbia University who left after three and a half years to become a reporter with The World, a New York City newspaper. "We were delighted that this terrific collection got its moment in the limelight," said Rare Book Manuscript Library Director Jean Ashton. "Thanks to Aaron Frankel, the traces of two wonderful people have been transformed into something they would be proud of." Within the Theater Collection, the Rare Book and Manuscript Library houses the personal papers and archives of individuals and organizations devoted to theater, in addition to masks, puppets, stage models and photographs and related ephemera. The core holdings consist of nearly 100,000 materials from the Brander Matthews Dramatic Museum collection. Other collections relate to George Odell, author of Annals of the New York Stage; Dirce St. Cyr, translator of dramatic works; James Woodman Thompson, New York stage and costume designer; Randoph Somerville, organizer of the Washington Square Players; and Joseph Urban, the Austrian-born architect and artist who designed original settings for the Ziegfeld Follies and the Metropolitan Opera from 1915 to 1932, in addition to the materials of other notable poets, writers and set designers.